It was great to meet you and hear your talk about your book and staying fit and healthy. Debby and I met you alongside Matt. I’m an ophthalmologist in Columbus, and am often asked by patients how I seem to never age. I always tell them to “buy the book”! Yours, of course. I got it as a gift from my brother 10 years ago, and found it to be the best of its kind, and still reference it in my practice. Thanks for coming, for giving such an energetic talk, and for being an inspiration. Your email newsletter on AFib went a long way towards helping me understand what the heck it is and how it’s treated. I know several (very healthy otherwise) friends diagnosed with AFib – one whose been resuscitated a couple of times, which sounds pretty frightening. Bottom line, your description of AFib causes, symptoms, and treatment answered my questions as well as reminded me that I’ve never had an EKG or other heart diagnostic exam. At the tender age of 65, I’m probably wise to get checked out. What Is Chronic Venous Insufficiency? . I was diagnosed with CVI when I sought treatment for unsightly spider veins in my legs. I assumed that I needed sclerotherapy treatment to solve the spider vein problem, however when an ultrasound was done on both legs, I was told that I had CVI and that was probably what was causing the spider veins and varicosities in my legs. This was totally new to me – that what I previously understood was simply a cosmetic issue of unsightly spider veins and varicose veins was actually symptomatic of CVI. I did some research and discovered that CVI affects approximately 40% of the population: https://my.clevelandclinic.org/health/diseases/16872-chronic-venous-insufficiency-cvi AND that very few people seek treatment for it. It’s a primary cause of DVT, Phlebitis and several other serious vascular issues but people don’t typically seek treatment until their symptoms are severe. The good (and unexpected) news is that my health insurance covers the treatment with endovenous thermal ablation which has excellent results. I’m scheduled for treatment in the next month and can report back to you if you are interested. I wanted to see if you’re interested in writing a newsletter discussing the symptoms and treatment of CVI because it’s a disease that most dramatically affects older people, is little understood, and for which few people seek treatment. As I said, I’m happy to follow up with you as I complete my treatments. In the meantime, perhaps you’ll let me know if you’re interested in sending a YNY newsletter regarding CVI. Thank you for your never-ending commitment to supporting us “older-but-younger-than-our-years” folks with your beautifully crafted newsletters. Thanks for a great and valuable book! I have been following your book’s Younger Next Year outline for the past 3 -4 months and have lost 20 lbs., and improved my overall fitness and have added 20+ yards to my golf drives! Irons are all 10% longer as well. Weight goal is to be 190, so 14 lbs to go. I have always been an athlete and in decent shape, but I have really been motivated by your book. I am 71 years young and plan to be younger next year. X country skiing will be starting soon, can’t wait. Hike weekends now, just put the kayak away for the season, ordered my rowing boat, a Whitehall 14 solo. Can’t wit till delivery next spring. I still work full time and have no interest in retirement. Still working with someone to partner with us to get you up here for a presentation. I have given away 10 copies of your book, and will continue to give them to my clients and friends. Working on not eating “crap” and keeping it to 2 drinks, but I admit to not being “there” yet. May not ever be, but the results are the results and so far, so good. Just completed some minor surgery, which could have been major surgery and actually life threatening, had I not heeded your advise in your first YNY. You wrote about the episode with loosing part of your nose to the pretty, little dermatologist and followed that with a serious warning to have our skin (head to toe) checked out regularly to keep some nasty skin cancer surprises from sneaking up on us. Well, your warning, coupled with my wife’s recent discovery of two such skin growths caused me to get to our dermatologist for a check and guess what? That little growth on my shoulder (which I couldn’t see without a mirror) was melanoma! Luckily, because of having gone when I did, it was successfully removed on Monday and all is well. Thank you again for the little prod! It most likely saved my life. As you know, melanoma is a real killer unless one catches it in time. You may want to consider another short warning to your reading public when you publish your next Fortnightly. Also pleased to report that I had a great 5K, road race last Saturday and actually improved my time by 17 seconds over my effort in March. Life is good and keeps getting better! Chris, My son 23, bought me your book when I turned 60 this year, I was struggling because I had acquired a new super power: invisibility. He told me I wasn’t aging, I was decaying-that scared the hell out of me. Worked in Medical Sales all my life, you’d think I’d take my health more seriously, but two decades of spreadsheets, corporate meetings, and client attention found me 100lbs overweight. Now I do aerobics 1 hour 6 days a week, and lift(with my boy) 6 days a week too. Thanks for the motivation. Your book was funny, inspiring, and down right informative-it’s my second bible. I am sorry about Harry! I am a retired 63 Year old School Teacher, Research Radiographic Technician, Businessman, Ecologist. I have been super active my whole life (Track, Ultra running, Bike road racing , Bike Packing, Triathalons, Masters Swimming, Volleyball…. I read your book, 1st time 3 years ago and took it up! My work outs have beeen focussed on whole body fitness (aerobics, weights, agiliy exercises…). 2 weeks ago I had a heart attack! Right Coronary Artery 100% occluded. 3 stents put in and a blood clot removed. Thanks to Younger next Year my MI was minor. I had built up an enormous collateral blood supply that kept the muscle alive. My doctors are amazed and say I will make a complete recovery. Chris – In my May 2013 comment, I mentioned that kedges were working for me. Just thought I’d send you an update as I have continued to make progress. In 2015 I ran 3 x Ironman 70.3 races and achieved All World Athlete status for my age group (still 50-54). This year I set a kedge to run my first full Ir0nman (3.8k swim, 180k bike, 42.2k run). Last weekend I achieved my goal by finishing the Ironman Western Australia. Along the way I am now down over 65lbs and the journey has been nothing but fun. That said, I think 2017 is going to be a ‘rest year’ for me. 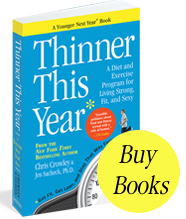 Just finished “Thinner This Year” and have ordered the exercise book! I am 65 and have been blessed with excellent health. I have been an avid exerciser and have stepped things up for the last year because I am convinced that exercise is the key to staying young. However, I didn’t know a lot about the science behind exercise or techniques to do it correctly. I have been looking high and low for some sort of guidance. I knew I wanted a guide directed towards someone of my age. I ran across “Thinner This Year”! Yesterday I worked through the warm up before I went to the gym. Wow! I can really feel some muscles that haven’t been worked for awhile! Today I am going to try some of the strength training after the warm up. Also, I just ordered a heart monitor. I have to admit I am a bit intimidated, but am determined to do this! I am inspired by all of the success stories and hope to be writing about my own very soon! Thank you!!! 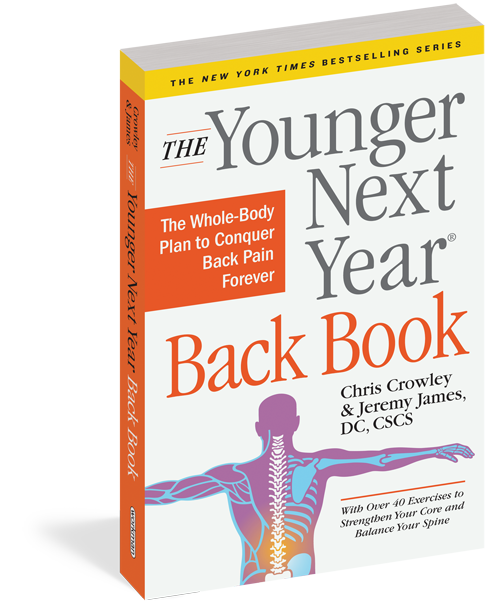 Chris and Jen- Reading your two books has changed my life incredibly!!! I am 64 and retired at 63 for the third time. I have always been a Yo-Yo dieter in the textbook sense. One diet that worked for a short time was the Grapefruit Diet. I shed seventy five lbs over a year only to gain back eighty percent of it in the next year. Why you ask? Because as you two both know…….dieting does not work. It takes a “lifestyle” change to make a difference. Old Habits die HARD!! A good friend of mine told me upon retirement, to make exercise and good health my next Career! So now I ask him if he thinks I am doing this “lifestyle change” correctly and safely. He gives me the go ahead to continue doing what You and Jen are telling me to do. changeD my blood pressure meds from a combination med to a single beta blocker! Of course I have him tracking my health every six months and making sure I stay the course so to speak. He will take me off of the blood pressure med if my blood work and other exams come back good in December. The best news that I can give you is the following. I no longer crave the BBQ and Deserts and Corn in a Bag (Cheetos). I drive right past the Ice Cream Stores and the Chocolate Shoppes without any sadness. You two are so CORRECT in your philosophy. The body does not ask for much, just feed it the proper nutrition and give it some vigorous activity and it will reward you with GREAT Health!! I now bike Six Days a Week and ride 20 to 42 miles each day. I feel better than I have in decades!!! By the way and not to minimize its importance. My wife is doing the same lifestyle that I am living and she even rides with me on Sat and Sundays. We have regained a closeness that is so important in a marriage and in life. She is 13 years younger than me and now she can see that I will not be departing prematurely due to Obesity and bad health! She LOVES my Stir Fry dinners! Come this September. my Cancer Doctor is going to FLIP when he sees the dramatic change that his advise has made in me! YOU TWO ARE THE BEST!!!!!!!!!! !